Kalamazoo, MI April 15, 2016 – The KSO is always grateful to the eighty-eight musicians that create the exemplary music and educational opportunities that have thrived in the Kalamazoo Community for more than 95 years. The symphony is proud to retain the talents of these musicians, often for decades. In this case, they would like to pay special tribute to their Principal Tubist, Robert Whaley, for 50 years of dedication and hard work. Robert joined the Kalamazoo Symphony Orchestra in 1966 and will be recognized for his 50 years of service at the KSO’s season finale concert – Elgar & Stravinsky, Saturday, April 23, 2016, 8pm at Miller Auditorium. 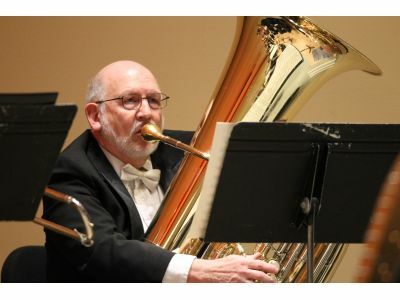 Robert Whaley is ending his 50th year as Principal Tubist of the KSO this season. During his long tenure with the orchestra, he has twice been featured as a soloist, performing concertos by Ralph Vaughn Williams and Torbjorn Lunquist as well as conducting the KSO wind section on a Chamber Music Series concert featuring the Mozart Grand Partita and the Dvorak Serenade for Winds. In addition, he often led wind and brass sectional rehearsals for the KSO. He is now performing with the newly formed brass quintet (2014) West Michigan BrassWorks. Mr. Whaley is Professor Emeritus of Music at Western Michigan University, joining the faculty in 1966, and is a founding member of the renowned Western Brass Quintet. He retired from WMU in 2001. During the academic year 2004-2005, Mr. Whaley rejoined the Western Brass Quintet culminating in a featured concert at the International Trumpet Guild Conference in Bangkok, Thailand in June of 2005. In 1990, Professor Whaley was the first recipient of the College of Fine Arts Teaching Excellence Award, one of eight awards in the University funded by the Michigan State Legislature. He holds music degrees from the University of Kansas and the University of Iowa. His tuba studies were with John Hill, Arnold Jacobs and William Bell with additional studies in instrumental conducting with James Dixon and choral conducting with Clayton Krehbiel. Mr. Whaley continues to be active as a chamber, solo, and orchestral performer. His career has included numerous solo and chamber music performances, including a highly acclaimed solo recital in New York City’s Carnegie Recital Hall. From 1989-1995, he was Music Director of the WMU University Orchestra. He maintains a limited private teaching studio of outstanding high school students in the Kalamazoo area. He is married to Judith Whaley, a retired recorder performer and teacher, and mother to their three adult sons. They have three very active granddaughters, all of whom participate actively in musical activities. Mr. Whaley’s spare time involves golf, tennis, and reading, especially about physics. The history of the Kalamazoo Symphony Orchestra (KSO) begins with its founder, Mrs. Leta G. Snow, local civic leader and future founder of the national American Symphony Orchestra League. Mrs. Snow felt that a local symphony orchestra was essential for developing a community with an attractive quality of life. The KSO’s first concert, featuring an all-volunteer orchestra, was on December 19, 1921 at the Masonic Temple under conductor Chester Z. Bronson. Now, ninety-five years later, the KSO is achieving artistic and institutional growth and excitement with eighty professional musicians under the leadership of Music Director, Raymond Harvey (appointed in 1999). The KSO is the state’s third largest orchestra with an operating budget of nearly $3 million and more than eighty musicians and professionals employed full or part time. Serving Michigan’s fourth largest metropolitan area, the KSO provides more than thirty concert performances each year, reaching more than 40,000 music lovers.